Figuring out where to eat always seems like a chore. Trying to find a new restaurant or avoiding the chain restaurants is more difficult than it should be. So when a co-worker of Nate’s recommended a Peruvian restaurant for us to try, we were instantly excited and couldn’t wait to try a new restaurant AND cuisine. 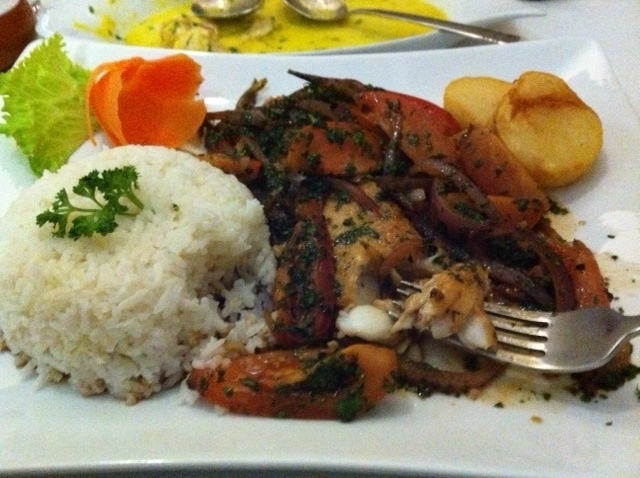 Machu Picchu Peruvian Cuisine is located in the north Raleigh area, but if you live anywhere in the Triangle, and you haven’t tried this place, you are sorely missing out! Honestly, from the outside, the restaurant could be mistaken for a take out place. And had it not been recommended to us, we may have never stepped foot in there. But, we are so glad we did! Nate and I are very critical eaters. It is like we review every restaurant we go to. However, when we are on a double date or out with family, we know how to control it and tone it down. 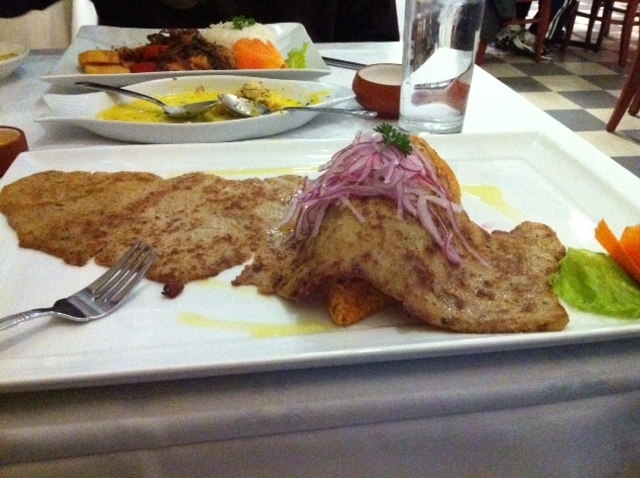 The service at Machu Picchu was PERFECT…and I have never said that about any restaurant we have been too…ever. The waitress was attentive, friendly, on time, our drinks were never empty, not overbearring, and she really seemed like she enjoyed being there. The food and presentation was outstanding! The piece of breaded pork was longer than my arm…quite impressive. The ceviche didn’t last long enough for me to take a picture. Did you know, taking a shot of Leche de Tigre can cure a hangover? Well, I almost gave myself a hangover just to have an excuse to take a shot of that sauce. Citrus and cilantro, one of my many weaknesses! The vegies on top of the deep fried fish were so fresh, the flavors didn’t get lost in the sauce. The price was very reasonable especially when you factor in the portion sizes and the overall experience you are getting when dining here. You could really spend as much or as little as you wanted. You know, I think this restaurant just made it to my top 3 favorite restaurants…in Raleigh! 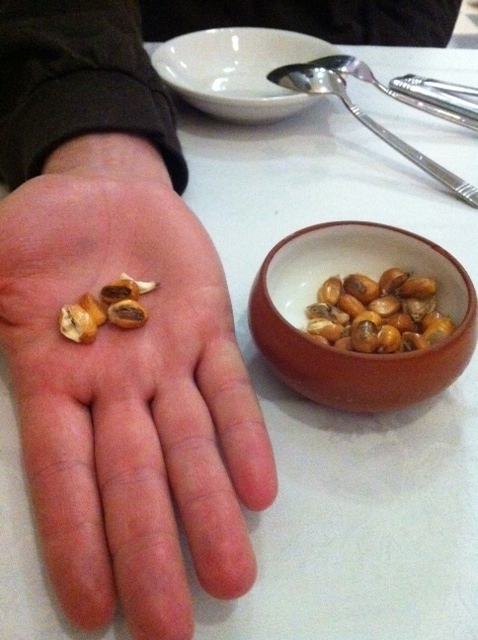 Cancha – Not on the menu – Nate put it best when he said, “this is like inside out popcorn.” Huge corn kernels roasted until they expanded even more and were soft in the middle. A nice vacation from the usual bread or tortilla chips served while you are waiting. Ceviche mixto – A great combination of fish and shell fish cooked and marinated in Leche de Tigre, red onions, cilantro, served in the traditional style Peruvian white corn, sweet yam. ‹ PreviousA Quick Woohoo, 100 Followers! My only nit-pick was that my dish needed sauce…but I'm a sauce girl. Loveeee my sauce!